Cherries (Prunus avium) are the beloved fruit of our childhood and most of us will never forget how their sweet, juicy, fragrant flesh put smiles on our faces every summer. But what we didn’t know was that these small, round, bright red drupes were one of the healthiest foods in the world. Not only do they promote longevity, but they also have impressive anticancer properties. Cherries are a powerful combination of antioxidants, vitamins, minerals and other nutrients with several wonderful health benefits. Up next we will see just how healthy and nutritious they really are. The sweet cherries we all know and love are a variety of wild cherries known as Prunus avium which date back to ancient Rome. Cherry trees were highly appreciated for their health benefits as well as for their beauty even in prehistoric times. If you have ever seen an orchard of gorgeous, pink-white cherry blossoms, then you have seen heaven. Both the fruits and the blossoms are of economic importance, providing nourishment as well as breathtaking scenery. What do cherries look like? Cherries are botanical drupes or stone fruit, meaning each fruit has one large seed called a pit or a stone containing the seed. Fruits occur in an umbrella pattern and are attached to branches by pedicels of varying lengths so that all the fruits in a cluster are at roughly at the same level. The sweet cherry, the most common cultivar, is typically 1-2 cm in diameter, but other varieties may be significantly larger. 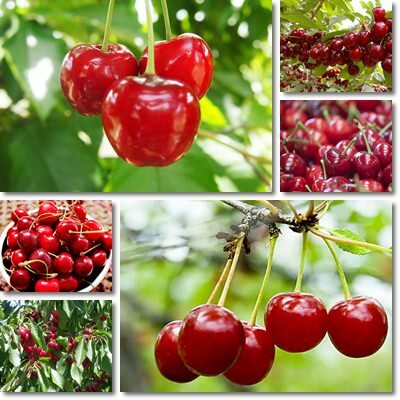 All cherries are more or less heart-shaped and have a smooth, bright-colored, edible skin. Generally, cherries are bright red, but there are cultivars which are dark red or mahogany while others are a dark purple, almost black color. There is also a variety of yellow cherry with yellow and red skin and golden flesh. What do cherries taste like? Cherries have a firm, meaty, but juicy flesh and thin skin. The common cherry is generally quite sweet, with light fruity flavors and a pleasant perfume to it. Yellow varieties tend to be even sweeter, while darker colored cherries have a richer flavor, intensely fruity, sweet and aromatic and a slight tartness around the skin. They are great fresh and cooked, but will provide the most benefits if eaten raw, preferably soon after being harvested. Cherry blossom nectar and pollen yield the famous cherry blossom honey, a honey variety with therapeutic properties (see benefits of cherry blossom honey). But why are cherries so unbelievably good for us? First of all, they are believed to be able to prevent cancer. Cherries contain Queritrin, a flavonoid (or natural plant pigment) with incredible anticancer properties. Regular consumption can supply the body with enough Queritrin to destroy cancer cells and prevent their proliferation. Queritrin is believed to be one of the most potent anticancer agents found in nature up to this point. In addition to this, cherries contain ellagic acid, a natural plant phenol with potent carcinopreventive properties. Ellagic acid can efficiently prevent the proliferation of certain carcinogens and thus inhibit the development of cancer. Both Queritrin and ellagic acid have amazing antioxidant properties. Cherries, and berries in general, are incredibly rich sources of antioxidants. Eating them regularly can repair the damage caused by free radicals. According to the ‘free radical theory of aging’, in time, the damage caused by free radicals builds up and causes premature aging, as well as diseases related to old age: cancer, arthritis, Alzheimer’s and so on. The antioxidants found in cherries, as well as blueberries, blackberries, red and yellow raspberries, prevent serious damage caused by oxidation and related health problems. This means that cherries can help us look young and fresh and add years to our life. Even more, perillyl alcohol, a compound derived from cherry essential oil, has been shown to reduce cancerous tumors in animals by inducing apoptosis (programmed cell death) in cancer cells. Although oncologists have not yet had success with human trials, it is believed that eating cherries may naturally offer protection against cancer. Sour cherries, also known as tart cherries, are reported to have similarly potent anticancer properties. 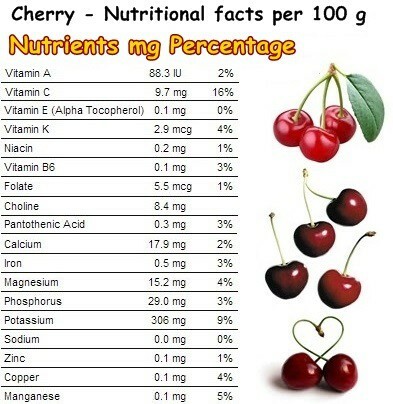 Cherries list even more incredible health benefits. For instance, they are a wonderful natural remedy against arthritis and gout, two painful serious medical conditions. Special natural compounds found in the fruit are believed to help relieve pain and slow down the progression of both conditions, resulting in reduced inflammation, reduced pain and improved mobility (read article on foods to eat and to avoid for arthritis and best and worst foods for gout). COX or Cyclooxygenase is an enzyme found in several flavonoids, including those responsible for the beautiful, bright, red color of cherries. COX relieves pain by eliminating its cause: inflammation. This enzyme acts similarly to ibuprofen and aspirin, but without the side effects. This means cherries are a potent, natural anti-inflammatory and regular consumption helps manage both arthritis and gout. In addition to all of these wonderful health benefits, cherries also supply our body with small quantities of almost all the important vitamins and minerals, notably vitamin C, potassium and manganese. Both vitamin C and manganese have antioxidants and have anti-inflammatory benefits. Vitamin C is one of the reasons why cherries help with arthritis pain and gout joint swelling. Eating raw cherries every day or drinking fresh cherry juice supplies important amounts of potassium and contributes to blood pressure control and cardiovascular health. Moreover, the fruits contain about 2 g of dietary fiber for every 100 g, making them great natural remedy against constipation. Eating foods rich in fiber such as walnuts, dry and fresh plums, almonds, sunflower seeds and cherries can help improve transit time, regulate bowel movements and relieve constipation. Eating cherries every day helps maintain a healthy colon thanks to the anti-inflammatory properties of the fruit. Also see Can You Eat Cherries With Diabetes? Conclusion. Overall, the fruit boasts a myriad of incredible health benefits and regular consumption can do wonders for our health. Cherries can help prevent cancer, relieve gout and arthritis pain, reduce inflammation and offer great antioxidant protection as a result of their amazing phytochemical content. Although greatly underrated, they are actually one of the healthiest foods in the world. Planting a cherry tree in your back garden is a great investment for your family’s health.